Not pretty for the Philippines on their home debut in the AFF Suzuki Cup against Singapore at the Rizal Memorial, particularly in the first half; but a tepid goalless draw in which both defences were on top of their games is not at all the disaster that it appears at first glance. There just happens to be this strange little thing called the away-goals rule, a neat little invention to settle home-and-away cup ties without having to turn to the dreaded toss of a coin as was the unimaginative way of doing so in the sixties. Because, if the aggregate score over two legs remains tied, goals scored away from home count double, then the Philippines may even be better placed than the visitors when the second leg is played next week in Singapore. When one comes to think of Amri’s first half miss and Duric rising to head a lovely cross from the right flank wide in a situation where he normally scores, one sort of wonders if some things are – indeed – really preordained. If the Philippines score, then it goes without saying that Singapore have to score twice to win the tie and get to the final. Even if Singapore manage to go into the lead, a single goal will not be one to sit on because a Philippines equaliser still sends the latter through to the final. Not that, in the Singapore leg, there is even any indication as to where a goal will come from if the basis is to be tonight’s stalemate. For the Philippines – in the first half, in particular – the performance was not unlike a high school junior attending the prom for the first time. While Phil Younghusband, Patrick Reichelt and Dennis Cagara all had speculative shots at goal, none of these even remotely threatened the Singaporean goal. 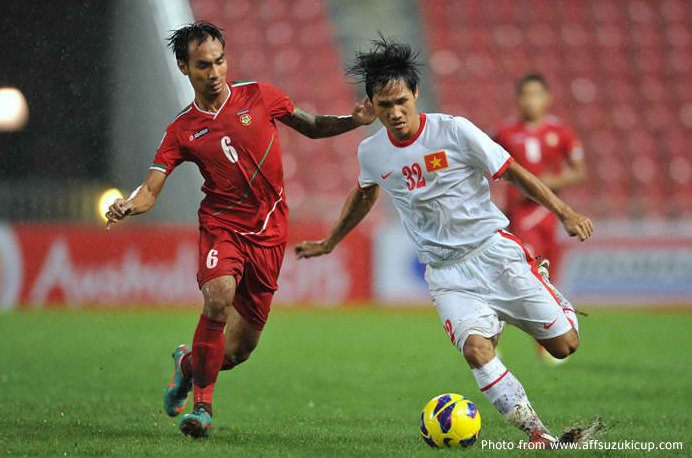 The players looked uptight and failed to complete the obvious and simple passes; and seldom posed an attacking threat to a solid Singapore defence. Let it not be forgotten, however, that even the pretty virgin maiden bleeds on her wedding night. Of the starting line-up, only the Younghusbands, Robert Gier and Jason de Jong were at the Bung Karno for the semi-final in 2010. This was, therefore, very much a bridal night for everyone else; and the fact that it was a first home match and a semi-final at that meant that the pressure was vastly different from the one at the Bung Karno. First of all, in 2010, the Philippines had exceeded all expectations and could have come away from the tie with any result with heads still held high. A mere two years later – after a third place finish in the Challenge Cup and winning its first ever international tournament, the Peace Cup – expectations have risen several notches above what they were two years ago. After a dour opening 20 minutes when both sides tested each other with long balls over the top and the most likely sources of a goal were dead ball situations, Singapore settled down to play their passing patterns. It was starting to look like a clone of the Cebu match. Indeed, as in Cebu, when the Singaporeans found themselves within sight of the Philippines goal, they finished as though there was a national ban on goalscoring back home. In the 17th minute, Khairul Amri latched onto a long ball from out of defence to get behind Gier, only to shoot lamely and allow Eduard Sacapaño to save. Eight minutes later, Aleksander Duric tried a leftfooted shot just inside the box. 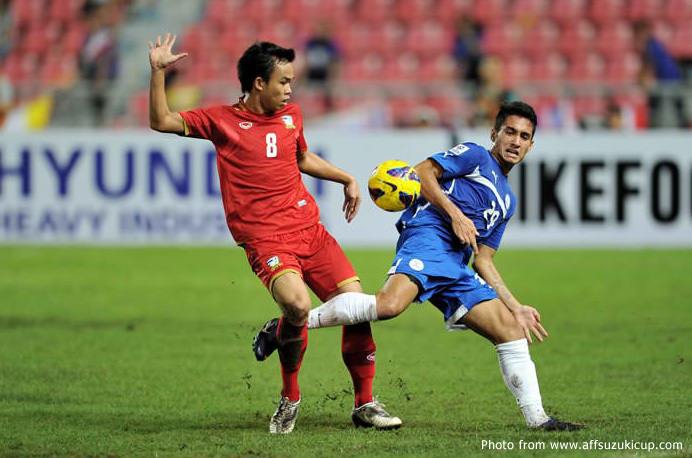 The ball eluded the entire Philippines defence and Shahri Ishak, arriving at the far post, had a free shot at goal. He was probably offside; but his shot hit nothing but side netting, anyway. Jason de Jong, who was having a bad day at the office, tried to bring the ball out of defence in the 33rd minute but was dispossessed. From the ensuing play, Ishak drove a low cross down the middle for Amri. Sacapaño dove to smother the chance. Perhaps, a looping cross to the unmarked Duric would have been the better option. The Philippines were a changed side after the restart when Marwin Angeles came on for de Jong. The passing became crisper and movement off the ball was better. With the Singaporeans still looking solid in defence, the closest that the Philippines came to scoring was in the 71st minute when, after Angel Guirado was fouled just outside the box, Paul Mulders curled a lovely freekick just wide of the near post. The Singapore defence was finally stretched in the 81st minute when the Younghusband brothers combined on the right flank to set up substitute Emelio ‘Chieffy’ Caligdong for a strike at a gaping goal. Caligdong’s failed to control the pass, however, and the shooting opportunity quickly passed. 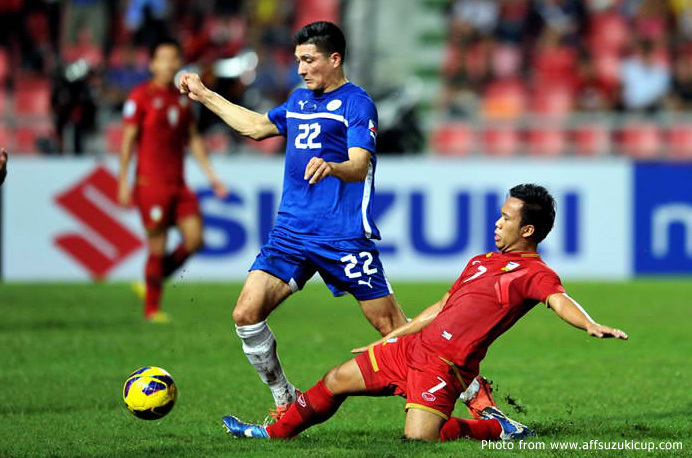 The Philippines head to Singapore for the return leg on Wednesday knowing that, while the Singaporeans are no pushovers and are probably entitled to think that they have the advantage, they won there last August and that their hosts are also probably at the mercy of the away-goals rule. When one comes to think of Amri’s first half miss and Duric rising to head a lovely cross from the right flank wide in a situation where he normally scores, one sort of wonders if some things are – indeed – preordained. Liverpool supporters who travelled to Istanbul in 2005 and Chelsea fans who made the trip to Munich last year know all about the feeling. We will all know in four days if the gods of football are really looking out for us.